An illuminated bone box in the heart of Summer Lee's art installation "Requiem"
Chinese migrants living in California in the late 1800s often arranged to have their bones sent back to their ancestral villages after death. Now, a new art exhibit in San Francisco’s Chinatown explores the roots of bone repatriation. 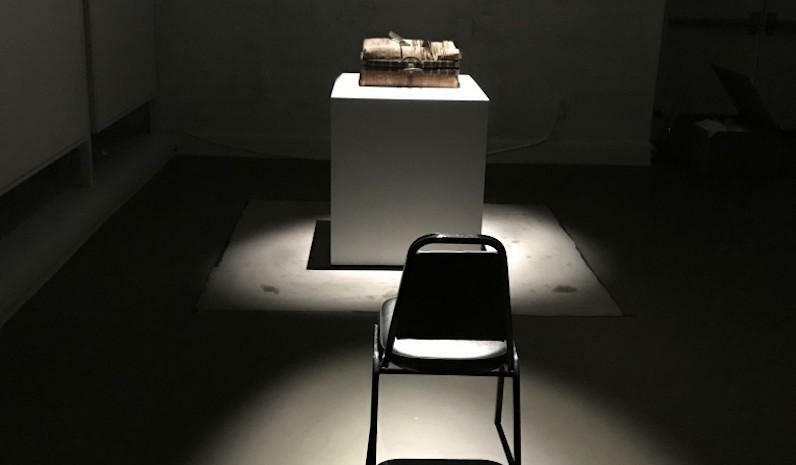 For San Francisco artist Summer Mei Ling Lee, it all started earlier this year when she stared into an empty, dilapidated box. Back in the late 19th century this very box traveled probably from North America to Hong Kong. But there’s a lot about it that we probably don’t know. It likely once held the bones of a man who left Southern China for work, but wanted to buried back in his ancestral village. Maybe those bones got claimed by his family. Maybe they were vandalized. All that was clear was the name inscribed on the inside of the box. It was enough to make Summer cry. Summer is a third generation Bay Area resident, and the descendant of Chinese immigrants. When she saw the bone box she was in Hong Kong, visiting Tung Wah Hospital, which commissioned her to make an art piece about its history. Since 1872, the Tung Wah Group of Hospitals has provided medical aid to the poor. And early in its existence, the hospital facilitated the repatriation of Chinese immigrants’ bones back to their homeland after they died. It was an effort to observe cultural death rituals, like second burials. In the late 1800s, Chinese laborers living in the Bay Area often arranged to have their recovered bones sent in “bone boxes” back to China. These bone boxes often had a layover in Hong Kong, where they were kept in Tung Wah Hospital’s Coffin Home. The hospital advertised in local Chinese newspapers, alerting families to come get their loved one’s remains. Some of them made it back home to their villages, and others stayed put. Summer is struck that even all these years later, the hospital plays the role of the family and remembers the dead. “Every day the caretaker lights incense to them as offerings that you would provide to your family,” she recounts. She was so moved by this gesture that she scooped up the ashes leftover from the incense the caretaker had burned in the coffin home and brought them back home back to San Francisco with her. Those ashes eventually ended up in her installation, “Requiem,” on display at the Chinese Cultural Center. The installation is dimly lit. Voices murmur in both English and Chinese as you enter. I’m encouraged to use a flashlight to illuminate the faint murals painted on the walls, murals made from that same ash Summer collected. These murals depict an imagined journey of these bone boxes. The Chinese Exclusion Act and other subsequent anti-Chinese laws not only banned entry for new immigrants — they also erased the possibility of family life for Chinese people who were already here. They couldn’t bring their existing families over, and there was little opportunity to create new ones. San Francisco Chinatown in the late 19th century was a bachelor town, and anti-miscegenation laws outlawed Chinese men from marrying outside their race. But the diasporic Chinese community created new, adaptive structures, like family associations. Family made these associations different from benevolent societies and from the tongs, other influential bodies that shaped the governance of Chinatown. David is part of the Lee family association, one of the oldest and most powerful in San Francisco. Decades ago, soon after his family immigrated, the association helped David’s dad find a job. When Chinese migrants arrived in the 1800s in San Francisco, they took a similar path: Checking into the association aligned with their last names, and paying dues. These associations helped orchestrate the bone-repatriation process, corresponding with Tung Wah hospital in Hong Kong to make sure the boxes got on the boats. Today, even though the practice of second burial is gone, the associations still provide burial services for their due-paying members. David remembers what it was like, helping bury the older members who died and didn’t have family here to take care of them. David agrees to show me the Lee family association. When we meet, he walks fast, clearly familiar with every nook and cranny of the neighborhood. I end up chasing him down Chinatown’s narrow streets till we stop at an unassuming door. On the first floor is the association’s credit union, where David worked in his late 20s. We wind up the stairs where a dozen or so seniors are reading newspapers or playing mahjongg. The walls are lined with black and white photos of generations of Lees. David cracks a smile and points to a picture of his dad, asking nearby members which snapshots are their parents. In a grand room on the top floor, the family altar fills a whole wall. A long wooden table faces it. David tells me this is where the family association meets. He jokes that members are less likely to argue, here in the presence of their ancestors. Ding Lee, another member of the association, busts out a genealogy chart that maps his family a thousand years back. Most of Ding and David’s family is buried in China and Taiwan — but not everybody. Both Ding and David have done reverse bone repatriations, bringing their ancestors remains here to the United States. They’re getting older, and it’s getting harder to fly back halfway around the world for annual holidays like Qing Ming, where you sweep the ancestors’ graves and make offerings as a sign of respect. For David, it’s important to keep up the rituals that have been passed through his family for generations. But he doesn’t do it for the sake of just doing it. Like his research into Chinatown, he has a scholarly approach that makes him investigate the very why of the matter. So he read about it. And he thought about it. And to him, the way that Chinese families mark death — it just makes sense. It makes a hard thing easier. An obligation to remember. That phrase rattles around in my head all day long and makes me think about that empty, torn-up bone box in the middle of Summer Lee’s exhibit. To be in a bone box meant having no family here. It meant travelling across the ocean to be united, at least in death, with the family you left behind. The people whose bones were in those boxes — they were forever searching for home, torn between two countries. But at least they’re not forgotten. In their continued, collective remembrance, their stories are made indelible. They’re woven into a safety net of mourning. “Requiem” will be on display until December 23rd at the Chinese Culture Center.